Thomas Puttick works from a small studio space in Sydney’s inner-west, but his outlook is on the world. The 25-year-old luxury womenswear designer, who began making patterns at 12, has signed a contract with Hong Kong-based retailer Lane Crawford. As one of six fashion brand runners-up in Lane Crawford’s inaugural Australian Creative Call Out, Puttick’s eponymous label will be stocked for at least two seasons across China and Hong Kong. The relationship includes mentoring, business advice and the opportunity to feature in marketing campaigns. Puttick launched his label in only 2017 and the same year was a regional finalist in the International Woolmark Prize. This year his e-commerce site opened and in May he released his fourth and most recent collection at Mercedes-Benz Fashion Week, Sydney. His career journey began much earlier, however. Key influencers were his oil painter grandfather and seamstress grandmother, his first teacher in the business. By age 15, in no doubt as to the direction he was headed, he had completed a pattern-making TAFE course. Puttick returned to Sydney to do a fashion and textile design degree at the University of Technology, combining it with internships with Alexander Wang and Helmut Lang in New York, and work with Christopher Esber in Sydney. Puttick has a business partner, one main patternmaker plus several contractors. He deals with one factory in Italy and directly with mills. Seventy per cent of fabrics come from Italy, the rest from Sydney. He believes that accessory offerings are the way to grow his business and will be releasing two styles of shoes with his next collection in September. He also has plans for a limited range of knitwear. With a clear vision of the career woman he designs for, Puttick has developed a silk cashmere singlet dress and a singlet that he envisages a customer slipping on underneath one of his work shirts. He’s also employed new leather techniques in embroidery and printing, including an extravagant form of blanket stitch for his raw-edged garments. 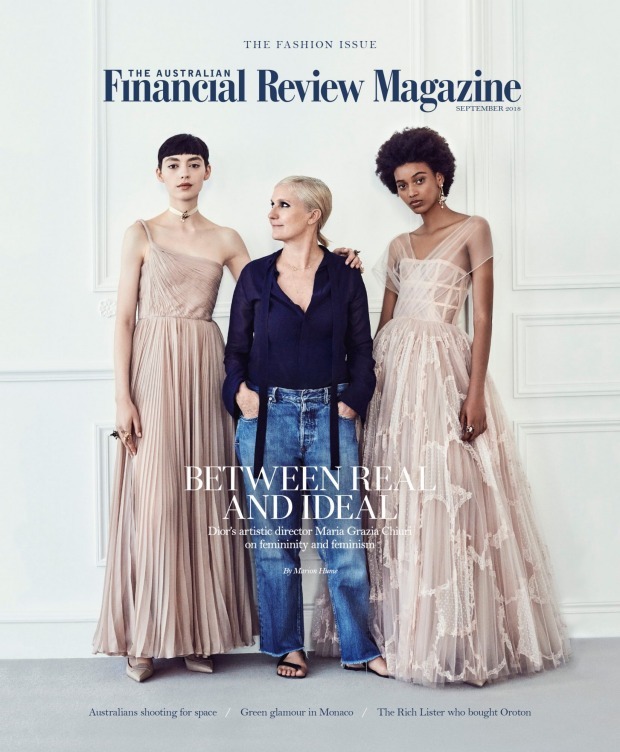 Maria Grazia Chiuri, the first female artistic director of Dior, on the cover of the September issue of AFR Magazine, in which this article appears. “I feel the last few months have been about developing key ideas,” he says. “My style is pared back in this period of maximisation.” For Puttick less is more, with more to come.